Last week I stopped by one of the big craft stores on my way home from taking Daughter #1 to college and picked up some yarn. I live 25 miles from the nearest yarn store – I’m going to try to visit every one I encounter. Just saying. Found Sensations “Rainbow Classic Pattern” yarn in BIG skeins (bulky weight – 447 yards, 227 grams. 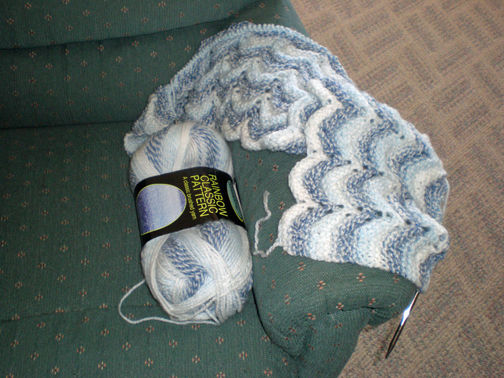 Pretty blue variegated and self-striping yarn that is working up wonderfully into a baby afghan. Pattern is Fanciful Rose – a very easy-to-memorize 3-row repeat pattern from Leisure Arts “Our Best Knit Baby Afghans” book, which I also picked up on this stop. A word on self-striping yarns – I don’t know about you, but I’m never confident that self-striping yarn will work up as advertised. A lot seems to depend upon the project. I once made a pair of socks out of a self-striping yarn that I thought looked muddy, but then made a baby sweater out of the same yarn, and thought it turned out very pretty and colorful (see previous post for a picture of Noa’s sweater). The picture on the band of the afghan yarn was not that remarkable, and I almost passed it by, but really liked the color and the variations. As you can see, the striping is working up very well in the afghan. I’ve been knitting more baby afghans than I expected (5 last year, and two, so far, this year). There are more people in my life (or grown-up children of people in my life, which makes me feel old) having babies. Afghans are fun, if you select a pattern that is lovely without being too complicated. This one fits the bill nicely, and I rotate between this project, the Lace Scarf and the Gardener Socks (see previous posts). Sometimes, I spend time on all three in one day. Not sure what that means. Fodder for another post, maybe.